Back from commercial and Samoa Joe is watching Finn Balor’s entrance on a monitor when an interview rolls up. He says preparation is simple, you make things more predictable. While everybody’s watching Finn’s WWE 24 special and feeling feelings, he’s doing analysis and learning how to hurt him. Finn Balor makes his entrance, and the match is up next after the break. Three-way stand off, Wyatt sits down in the corner and bails, leaving Finn to attack Joe, throwing forearms. Samoa returns jabs and knees, chops in the corner, whip across, Balor to the apron, a kick, and Bray applauds. Finn throws Joe outside, he returns Wyatt to the ring and Balor gets in it with forearms and kicks. Bray with clubbing blows, knocking Finn down momentarily. Rolling solebutt, forearm scrapes in the corner, but Balor charges into a boot. Gamengiri connects, pin, Joe breaks it up and fires a headbutt off. Knee lifts, Finn is hurting and Samoa throws him outside before moving on to Wyatt. Drawing the Eater of Worlds up by his beard but Balor comes from behind with strikes. Bray back up, he throws Finn outside and targets Joe but Balor is right back in and throwing hands. Kicks back the Eater of Worlds into the corner and lays Joe out with a kick. Forearm from Wyatt, off the ropes, that huge turning crossbody block and a right hand to keep him down. Slicing right backs Balor up in the corner, he sets him up top but Finn has punches to back him away. Samoa comes in, catching Balor, climbing to meet him, thinking superplex, Bray gets under, Tower of Doom! Wyatt fired up, hanging from the turnbuckles, Sister Abigail clutched but Joe comes in with the Coquina Clutch! Finn breaks it up with a boot, stomping a mudhole in Samoa! A boot for Bray, off the ropes for a tope con giro and we go to break. Finn Balor makes his entrance and gets on the mic. He greets Grand Rapids and says Balor Club is in the building. They have their hands full, because at Extreme Rules, they have a fieful– whoops, fatal five-way match where the winner faces Brock Lesnar for the Universal Championship. Enter Paul Heyman. He does his usual intro schtick and says one could make the argument that he’s out here tonight to scout potential victims for his client. Surely you heard Bray Wyatt paint a portrait of a WWE Universe without a Beast, well, he hates to vandalize his masterpiece, but if Bray steps in the ring with his client, Lesnar will paint him as a victim. Then there’s Seth freakin’ Rollins, he wants to compete in a fatal freakin’ five-way at Extreme freakin’ Rules, Brock freakin’ Lesnar will make him a freakin’ victim. Plus Rollins is the focus of Samoa Joe, hired mercenary, badass assassin, but against Brock Lesnar, he’s a victim too. Then we have the one that laid the Deadman down, Roman Reigns. The odds-on favorite. If Roman wins the five-way and challenges Brock, he will no longer be the end-all, be-all in WWE, he’ll just be Brock Lesnar’s victim. Which leads Paul to Mr. Balor. He asks if he can get in the ring and Finn invites him. Heyman reminds him he’s just an advocate and respectfully submits that Balor is nobody’s victim. He knows that the other contenders in the five-way have painted him as the underdog, but Finn is no underdog. They may not see him coming, but Paul E sees him coming, the Balor Club sees him coming. What was that prophecy he said? If you believe it you can achieve it? Paul believes in his heart that Finn is the most talented in-ring performer in WWE today, and perhaps more importantly, he believes that Balor believes that he’s gonna take the other contenders to the extreme, and he knows a little something about the word extreme. And furthermore he believes that Finn believes that he doesn’t look at Brock like a mountain of a man with all these accomplishments, he believes that his client is the same as the other men in the five-way. That if he steps into the ring with his client, he, just like the others, will be Finn Balor’s victim. So he’s most looking forward to the possibility of Balor/Lesnar for the Universal Championship. On behalf of his client, he wishes Finn luck and shakes his hand. Finn says he’s glad Paul is here. He wishes Brock was, but he isn’t, surprise surprise. But hey, being Brock’s advocate, maybe he can pass a message, and tell him that at Extreme Rules, he will win the five-way and go on to face Brock Lesnar for the title that he never lost, and you tell him that Finn said Finn Balor will beat Brock Lesnar. The show opens with a recap centered around Braun Strowman and Roman Reigns again. closing on the brawl from last week. And thence into Raw’s intro video. Commentary hypes up our Intercontinental Championship match and then Kurt Angle makes his entrance to really kick the show off. He tells us that Braun suffered a shattered elbow last week and flew directly back to the United States for surgery on his elbow and may be out of action for six months. Strowman had set his sights on the Universal Championship, so he has given a lot of thought to who should challenge Brock Lesnar next, but it has to be earned, not given. So at Extreme Rules, they’re doing a five-way #1 contender’s match for the Universal Championship. As for who’s gonna be in the match, it’ll be Seth Rollins, Samoa Joe, Finn Balor, Bray Wyatt, and Roman Reigns. So whoever wants to slay the beast will have to win at Extreme Rules. It’s gonna be historical and it’s gonna be extreme, it’s true, it’s damn true. He goes to leave but is interrupted by Roman Reigns. He gets in the ring and says we don’t need a five-way match because he’s the number one contender. This is his yard, he beat the Undertaker at WrestleMania, he put Strowman in that ambulance, and he’s the only guy around here that can beat Brock Lesnar. Enter Finn Balor. He says he’ll tell Roman the same thing he told Seth Rollins– he was the first Universal Champion and he never lost the title, so, uh, if you want a piece of the Beast, the line starts behind him. Reigns tells Finn he has a lot of heart but he doesn’t have the killer instinct to beat Brock. Finn reminds Roman that he beat him on his first night on Raw as a counterpoint. Michael Cole announces that Finn Balor suffered a shoulder injury against Seth Rollins and we see when Finn got injured during the running power bomb into the ringside barrier. Michael mentioned that Finn appeared on Good Morning America and he had an MRI that revealed a torn labrum. He will be out six months. Byron mentions that Mick Foley announced that Finn Balor would relinquish the Universal Title. Mick Foley and Stephanie McMahon are in the ring. Mick brings out Finn Balor. Finn says this championship represents a lifetime of sacrifice. It also represents that if you believe in yourself you can achieve anything. Last night, he achieved the impossible. He became the Universal Champion. There was a sacrifice. Finn says he wants to thank the WWE for this opportunity. He says he wants to thank the talent in the back. He says he wants to thank Seth Rollins for giving him the match of his life. Finn says he wants to thank all of you. Finn says he has to relinquish this title, but rest assured when he is ready to come back, this title is the first thing he is coming for. We are back and Seth Rollins is in the ring. He says he has never been more insulted in his entire life. 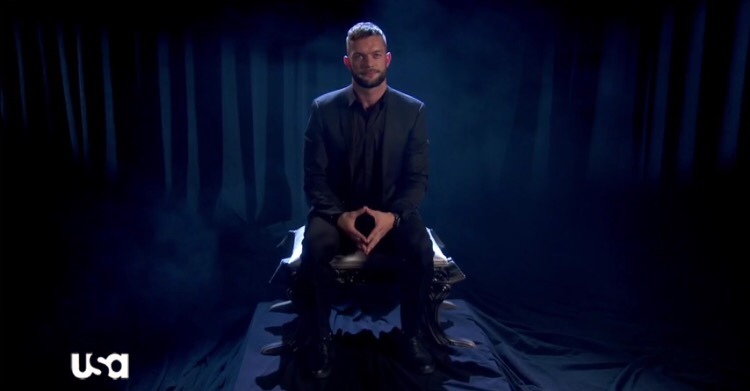 Last week Finn Balor gave us a history lesson about the Demon King and for what? Seth says he could not find the Demon King anywhere. Seth tells CNN, ESPN, Fox News, Jonathan Stewart, and Jonathan Coachman to get ready to sink their teeth into what he is about to say. There is nothing and no one that can stop him from becoming the first WWE Universal Champion. He promises you that. Seth says he is on another level right now. He looked all over for the Demon King. Seth says he will give the Demon King one more chance to come to the ring to face him. Seth says that Finn Balor is trying to intimidate him because he is afraid of Seth. Finn will end up like everyone else who got into the ring with him. If he wasn’t Seth Rollins, he would be afraid of himself. This is just another chapter in the book of Rollins. The Demon King will not come out to the ring to look into his eyes because he will see something more horrifying than he could ever imagine. He tells Finn he has nowhere to run or nowhere to hide. Something shows up at ringside and Seth wonders if that was the Demon King. He is nowhere to be found. At the end of the day, the Demon King will have no choice but to bow down. The lights flicker until the finally go out and it leads to Finn Balor’s entrance. Finn Balor appears and he is in full Demon regalia. Balor and Rollins go face to face. Rollins and Balor exchange punches and Balor with a kick to the temple. Rollins with an enzuigiri and Balor with a Pele kick and running drop kick into the corner. Balor goes up top but Rollins goes to the floor. Balor goes to the mat and then hits a plancha onto Rollins. Balor runs back in the ring and stands tall as a frustrated Rollins looks on from the ramp. We are back with a Finn Balor video package. He says that Seth has some misconceptions about him. What you call disrespect is honesty. What you call arrogance, he calls confidence. What you call ignorance, he calls fire. Do you know about the legends and myths? Do you know about Finn MacCool? He threw a piece of Ireland into the ocean and made the Isle of Mann. Do you know about the monsters? What about the King of the Demons? When his evil eye opens, the world ends. The grass burns, the sea boils and then the land catches on fire. When a warrior enters a great battle, he can tap into the power of these creatures and become greater than himself. He says he know that Seth has his demons, but you have never seen a demon like this. You will see the Demon at SummerSlam.